Welcome back to another great challenge at The CSI Project! This summer’s biggest wave of heat has finally passed, and we are all ready to get outside and enjoy our outdoor living spaces. What better way to celebrate the lazy days of August than with a quick spruce-up of the place you park your lawn chairs? We’re excited to see all the ways you’ve found to create, improve, or decorate these often-overlooked spots. Joining us as our guest judge this week from The Shabby Creek Cottage, Gina Luker is looking forward to seeing your outdoor spaces, too! Having recently redone her own porch, Gina knows exactly how much fun it can be to refurbish porches, terraces, and patios. (You can read more about Gina HERE.) She’ll be stopping by to visit each of the projects you link up to this week’s challenge. Gina will select an overall winner for the challenge, along with her 10 favorite projects. We CSI Girls will choose our favorites, too. All of our favorite projects will be featured in the winners’ post this Saturday. A feature isn’t the only thing you can win by entering this challenge. Thanks to this week’s sponsor, Dinky Bird Boutique, we have something special in store for a randomly drawn winner! Every project entered into this challenge will automatically get an entry into this week’s giveaway. (For additional entries to this giveaway, click HERE.) Our randomly drawn winner will receive this gorgeous silver floral fabric accessory, handmade by Stephanie of Dinky Bird Boutique. Before we start this week’s challenge link-up, let’s take a look at some of the outdoor spaces and tutorials that our guest bloggers have offered for inspiration, this week. Sybille from Funkytime showed us that it’s not just country gals who can enjoy a porch with her Urban Porch Makeover. 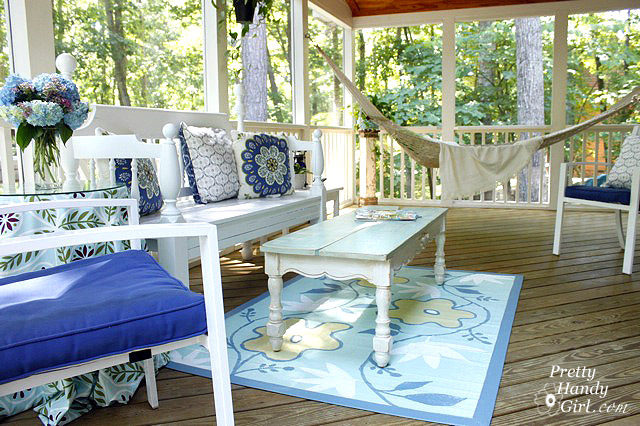 We got to see gorgeous blue and white screened porch decor from Pretty Handy Girl, Brittany. Now it’s time for you to take a turn inspiring us. We hope you’ll take the time to link up your porch, terrace, and patio projects this week. It’s so fun to see how you use your talents! We noticed that there has been a little confusion about how long the challenge is open for new links each week. Each week, the linkup starts Wednesday at midnight (EST). It closes Friday at noon (EST). You will still be able to visit the linked projects after the linkup button disappears, but you won’t be able to add any projects. Make sure you have your projects linked before noon on Friday! You’ll find the linkup for this week’s challenge at the end of this post, following the challenge rules. This challenge begins at midnight (EST) Wednesday, August 10th, and ends at noon (EST) Friday, August 12th. Now, won’t you join us out on the porch for some lemonade? Love all the great ideas! Thanks for hosting! Thanks hosting, love checking out everyones outdoor space! Thank you for hosting. First time linking up and a longtime follower. It’s been awhile since I’ve been able to join one of your challenges, so I’m so glad to be here today! I’m excited to link up my front porch, where I’ve tried to create an “outdoor living room.” I love the way it works for us, and I hope your readers like it, too! Thank you so much for hosting these challenges. I need to make some notes on my calendar about the upcoming weeks–it’s such fun to have a “kick in the pants” to get things done!